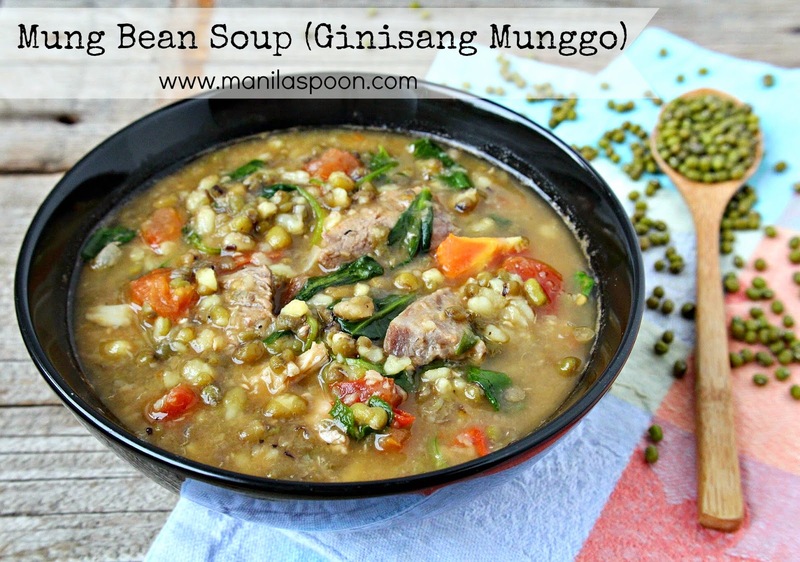 With beans, spinach, tomatoes and meat this hearty and healthy Mung Bean soup is filling and delicious! 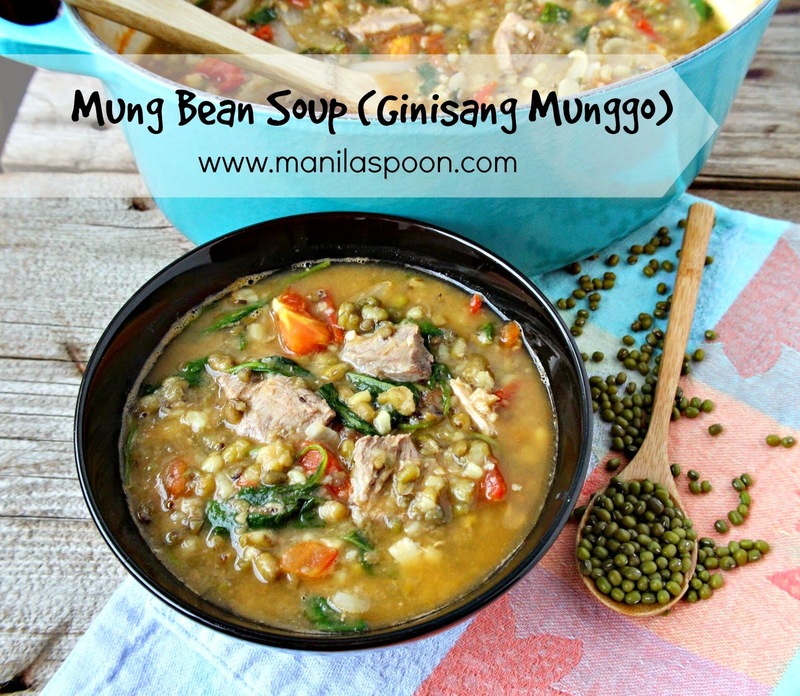 Mung Beans or locally called “munggo” is considered a staple food in the Philippines especially in the provinces. Just a small amount of mung beans with added meat (like chicken, pork, or shrimp) or even meatless truly goes a long, long way and can easily feed an entire family. I think that’s why it’s quite popular. Not only can it feed a lot of people – it is also quite cheap and also very nutritious! If you’re abroad, you can find mung beans either in the Asian section of your grocery or in any Asian store. My simple reason for loving this dish is because of the taste – and the fact that its also really good for you is a major bonus. My entire family loves this especially my husband and son. I love it with pork and I just cook both the beans and pork together which makes everything easier. If you don’t fancy pork, no worries – you can certainly use chicken, or shrimp or fish (usually smoked fish) and perfectly suitable for vegetarians and vegans because the meat is totally optional. My hubby loves the vegetarian version so I sometimes makes this without the meat; I just shorten the cooking time if it’s just the beans. And you ca leave out the fish sauce, if you don’t fancy it – the soy sauce and salt should be fine, too. I do add the fish sauce for extra flavour but it surely can be made without it. For this winter season, you can certainly make this soup. Others call it a stew but either way you call it – it’s hearty and delicious! This is my comfort food this winter! Enjoy! Place the dried mung beans and meat on a heavy bottomed, large and deep pan (like a Dutch oven). Pour the water over. Bring to a boil, cover and then simmer until the meat is tender (about 1 hour more or less). The mung should be tender already at this point. Refill the water as needed. If you are using Beef which takes longer to cook, I suggest boiling it first until the meat is slightly tender. Add the mung beans and continue to simmer until both the beans and beef are tender. Turn off heat. In another large skillet, heat the oil. Saute the garlic and onion for a couple of minutes. Add the chopped tomatoes and cook for another 5 minutes. Lightly season with salt and pepper. Stir the cooked tomatoes into the beans mixture. Season with soy sauce and fish sauce, to taste. Let simmer for 3-5 minutes. Add the spinach and cook for another 2 minutes or until wilted. If you want a thicker soup simmer until desired consistency is reached or if you wish a more watery one, just add more water. Adjust the seasoning if necessary. Ladle into bowls or have it with rice! So yum! If you like what you see and would like to receive new recipe updates, we’d love you to subscribe through email, get our feed or join our site. Feel free to like us on Facebook, follow us on Pinterest and Google+ too where you can get more recipes. Thanks and happy browsing! 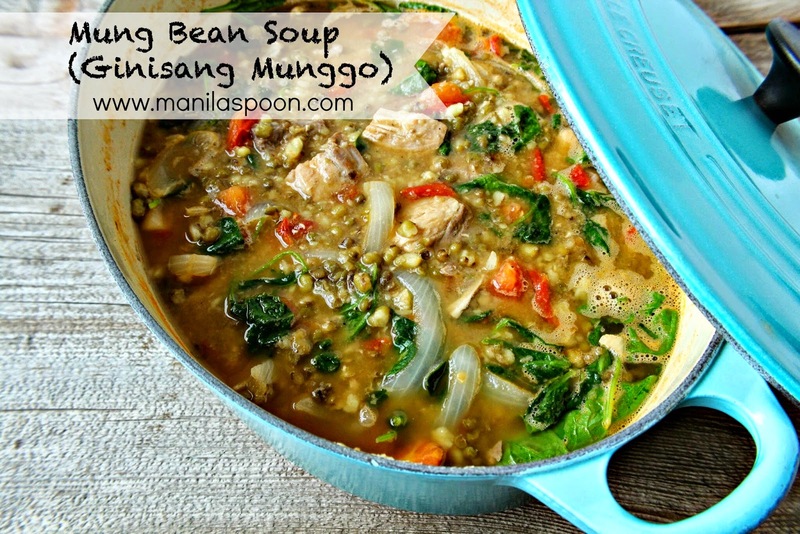 I have a bag of mung beans that I have been wanting to use–I can't wait to try this recipe. Pinned! Thanks, Kristen and hope you enjoy it! I've only sprouted mung beans, never used them in a soup! This looks insanely hearty and perfect for a chilly night. I'll have to look around ad see if I can locate a stash of mung beans to make this with! Any Asian store should have it Jerry. Thanks for stopping by. Or Indian store, which is where I bought mine. Oh and the health food area in most major grocery stores. What an amazing looking soup. I wish I could have this for dinner tonight! I love using legumes to stretch dishes. This stew looks wonderful! Can regular lentils be used? Yes, you can use lentils instead. So delicious!!! I don’t eat meat so I just left it out and followed the rest of the recipe and it is sooo yummy!!! Thanks for sharing this recipe! I am so delighted to know you enjoyed this! It always amazes me until now how truly delicious this is. So good. Thanks!